You can buy stocks or bonds with a click of a button, but there are many markets around the country that offer a better return for businesses, investors and individuals that are looking to grow their nest egg. However, finding the best market for your business, rental property or next investment opportunity may require looking out of state. Utah was named one of the top three states for business last year by Forbes (#1), Entrepreneur magazine (#3) and CNBC (#3). For businesses large and small, there seems to be no better place to invest in your company than Utah. Commercial real estate growth in Draper, Utah is proof that even cities with smaller populations are benefitting from the business-friendly environment. Local business leaders, including the chairman of Coldwell Banker Commercial Advisors Brandon Fugal, believe that the expanding economy will help attract even more investment. If analysis from Forbes is correct, Utah can expect to continue seeing $800+ million in annual investments just as in years past. 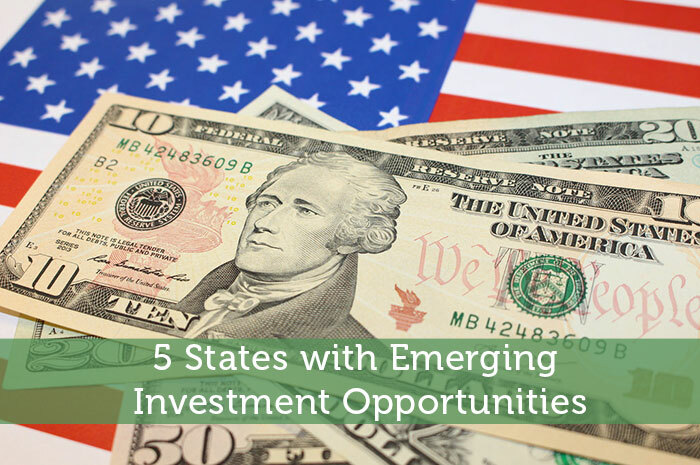 Despite the oil downturn, Texas is still a great state for a variety of investments. In the Lone Star State they seem to be transitioning from one energy source to another. If you’re into renewable energy there’s no better place in America than Texas. It’s blowing all the other states away in wind energy generation. There are also plans to dramatically increase solar farms in 2016. With its business-centric policymakers, growing population and affordable cost of living, Texas is a great option for any kind of startup that wants to scale up. Another sound investment is residential real estate in Dallas. The residential rental market has shown to produce a 20% return. Houston and Austin also had admirable returns. Bankrate projects that Houston’s rental market will have a gross yield of more than 11%. Whether you’re living, working or playing, Colorado is a desirable destination. The entire state enjoys year-round tourism thanks to its ample outdoor activities, but major metros are beginning to expand their business horizons. Denver tops out many lists for the best city to do business. The state also offers a high quality of life so it’s much easier to recruit top talent. Mile High City has also seen the strongest appreciation in the residential real estate market in the last two years. It’s been so strong that it’s one of the top markets in the U.S. for foreign investors. And we couldn’t discuss investment in Colorado without mentioning the legal marijuana industry. Whether or not you personally agree with the policy, there are definitely opportunities for investment is this burgeoning industry. In 2015 Colorado made $700 million in sales, and it’s projected to hit $1 billion in 2016. Some investors are comparing marijuana to the new gold rush, and there are many investors that want to be among the first to buy in. Let’s just say when Washington, D.C. is within the confines of your state, business is always going to be happening nearby. It may be the capital of America, but foreign investors are also buying into Washington, D.C. at an impressive rate. As of November 2015 there was a 100% year-over-year increase in foreign real estate investment. It also helps that many areas are affluent with statewide household incomes that are $10,000 over the national average. Despite real estate busts and the constant threat of natural disasters, PricewaterhouseCoopers (PwC) has a lot of confidence in Florida as a hot spot for investments in 2016. PwC noted seven emerging markets in the Sunshine State, which is more than double any other state in the nation. One reason Florida has gained in popularity is because there are a number of 18-hour cities. These are second-tier cities that are populace and active but not constantly running at 100% like major metro, 24-hour cities. They have become very popular among millennials and active baby boomers – the two largest generations. This diverse, growing population means that there’s going to be strong job demand in 18-hour cities. It’s a great opportunity for growing businesses that need to expand their workforce without dramatically increasing their operating expenses. Moving from a 24-hour metro to one of Florida’s 18-hour cities could actually lower costs. All these factors are also influencing real estate investors that know a growing population and stable economy helps increase return. With the population growing by approximately 300,000 new residents each year, the need for new development is increasing as well.